The Nigerian government has finally decided to diversify the economy indeed and in truth with the Agriculture and Solid Minerals sectors taking the front seat. However, the focus of most operators in the sector are mainly the crop production and animal husbandry. So many other operators are not interested in what I will like to call the Agricultural sector enabler or demand driver which is value addition. According to the publication of Agricultural and Applied Economic Association, Value added Agriculture is a portfolio of agricultural practices that enable farmers to align with consumer preferences for agricultural or food products with form, space, time, identity and quality characteristics that are not present in the conventionally-produced raw Agricultural commodities. It appears that it is common sense that one should be know that value added Agricultural products will generate more revenue and at such should be of interest to anyone in this sector. However, many have decided to look away from this and just simply focus of the product and sales of the raw commodities. This disposition to value addition has been attributed to various reasons like capital, competence, machinery etc but in my opinion, I think chief among the reasons for this is the issue of mindset. The Federal Government of Nigeria has for many years programmed Nigerians to think only in terms of commodities when it comes to export trade business. This has been consistently demonstrated by the export of crude oil by the government. This has continued for more than 3 decades and hence all the government programmes, infrastructure development, incentives, capacity building have been geared towards the development of the oil and gas sector. All these have created a mindset that made people to think less of Agriculture talk less of value added Agric business when they are thinking of investing in any business. To correct this anomalies, I will recommend that the government set a short term and medium term goals. The focus of this article will be on the short term goals, while the medium term will be considered in another article sometimes in the future. The short term goal should include the establishment of Agro processing centres across the country in order to enable the Small and Medium Scale Enterprises (SMEs) to have a point to take off their business in order to build their capital and ultimately set up their own processing factories. It is interesting to note that the federal government has started this in some parts of the country. It will be great to not just extend this all the states in the federation, but also ensure that this kind of facility is present in all the senatorial districts of each state of the federation. This model validate the fact that, an Agro processor do not really need to have all the funds to set up a factory before he can own his own brand. Another way of replicating this model is Contract Production. This involves a process whereby, an intending Agro processor (client) partners with a processing factory (factory) that currently produces or has the capacity to produce his dreamed product via a joint venture agreement. The client produces his packaging materials and deliver them with his raw materials to the factory. The factory then processes the product, put it in the package received and deliver it to the client for onward distribution to the market. To the extent that most of the Agro processor are processing various food items for mankind, it becomes highly imperative for those products to be of very high quality that is fit for human consumption. Therefore there is need for regulation. However, A situation where the Agro processors and other entrepreneur sees the regulator as an impediment to the progress of their business is not good for the country. I will strongly recommend that the National Agency for Food and Drug Control (NAFDAC) carry out a thorough assessment of its processes, do some internal cleansing and carry the following reforms. The Agency should make public a timeline for the registration of any product with the agency. The phone number to call when there is unnecessary delay should be made available to the public. The procedure for escalating any issue to the Director General should also be made known to the public. In addition to these, besides the checklists on its website, the exact fees payable to the agency for various degrees of products and registration should also be made known to the public. All these information should be made available to the public via its website, conspicuous display in all the NAFDAC offices across the country. It will be good for NAFDAC to identify a very patriotic staff who will be able to inspire others and champion this initiative and reforms in all its offices across the country. Considering the fact that Nigerian Agro products is going no where in the export market if the populace cannot trust NAFDAC to do their job patriotically. I will also strongly recommend that the presidency directly supervise the activities of this agency in order to ensure strict adherence to all its directives. 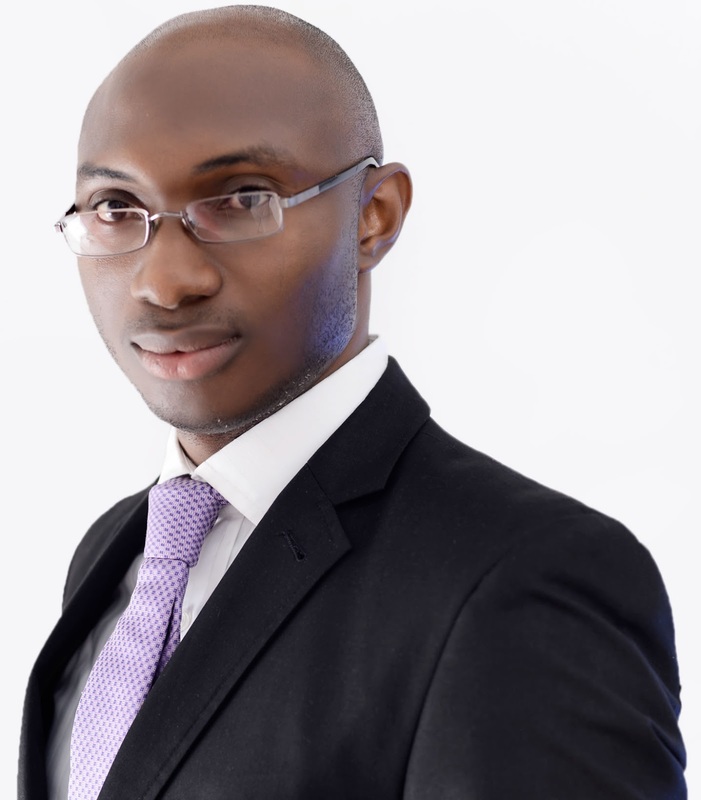 Having taking care of the production and regulation, the next thing I think the federal government should do in order to attract more investors into this sector is to give some tax relief. This is mainly due to the fact that the level of infrastructural deficit in the country is going to make the business to be highly unprofitable. A typical Agro processor in Nigeria will need to tackle the issue of power generation, water supply, cope with high cost of transportation and protracted transit time and all these contribute significantly to the high cost of production and thus, making the products pricing to be non-competitive both in the local and export market. All these are the basis for recommending that the Federal government should consider giving some tax exemptions to the Agro processors until the business finally stabilise. The last recommendation is the issue of Promotion. This, in my opinion is more critical than the ones stated above, and without it all other recommendations will be an effort in futility. The neglect of this has been the bane of all the programmes and initiatives of the government. Typically in Nigeria, when the government starts a new programme, it is either not promoted at all after the launch or they will simply do few insertions on newspaper, radio or television for a few days and that will be all. 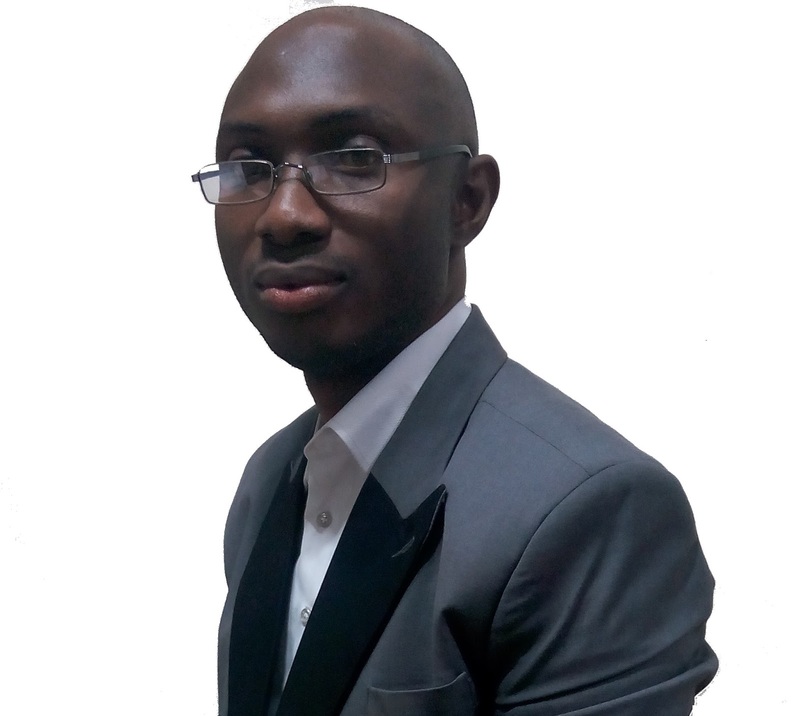 The federal government needs to take a cue from the serious minded businesses who will promote their products or services for several months or even years because they realise the AIDA theory in human psychology. This model says that an individual will usually go through four phases (Awareness, Interest, Desire and Action) in response to any promotional efforts. This theory says that the initial promotion only created Awareness and generate Interest with continuous promotional efforts. As the promotion continues, this makes them to begin to Desire the product or service and further promotion eventually makes them to take Action. What the government usually do is to stop after creating awareness and this only allow few people to benefit from its programmes and hence the minimal impact and eventual failure of the various government initiatives. In conclusion, if we want to create jobs, if we want to reduce post-harvest losses, if we want increase demand for Agro produce, if we want to grow the agricultural sector, if we want an inclusive growth in the Nigerian economy, then we must aggressively pursue value addition to most (if not all) of our Agricultural products. 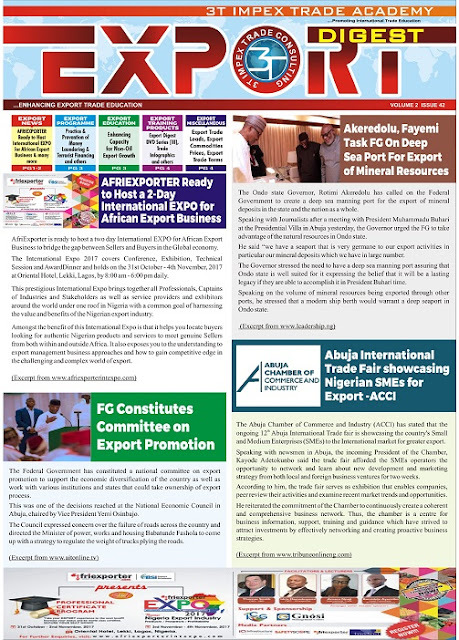 As part of her numerous efforts to grow the exportation of value added products from Nigeria, 3T Impex is has gone into partnership with Signet Corporation Limited in the UK to launch an African Export Development Initiative (AFED) during her weekly . This programme is geared towards working with Small and Medium Scale Enterprises (SMEs) to facilitate the exportation of their various products in the UK and EU markets. Some of the features and benefits of this initiative include aggregated export service, shared cost of shipment, export market development for SME’s, and low risk entry into export market. Other benefits include ready buyers in the UK and EU market, free product packaging advisory service, short export business cycle 90 days form shipment date) to mention but few. This initiative is designed to protect exporters from the pitfalls associated with export business and help to get their products into the export market while also learning in the process. 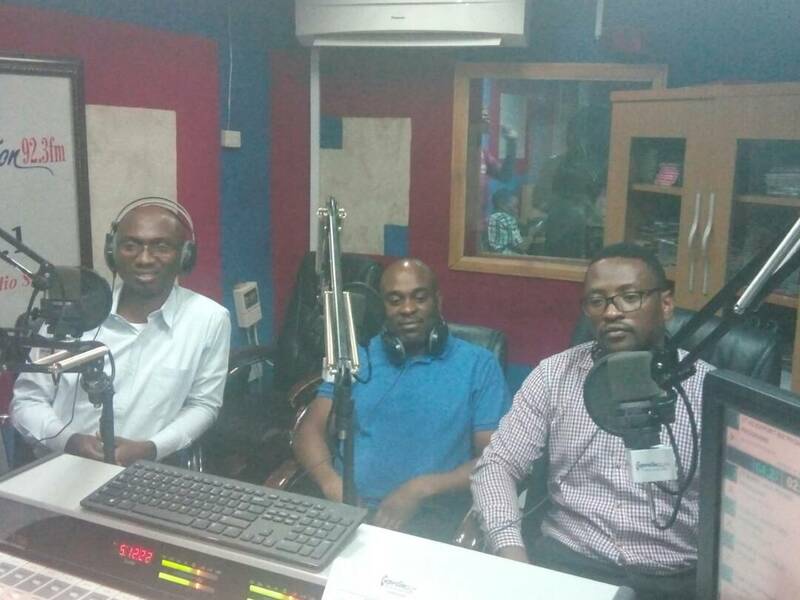 To be part of this initiative, please call 08091244449 or send an email to tradeacademy@3timpex.com. Nigeria as a developing country mainly depends largely on commodities as the major products in the non-oil export sub-sector of the economy. This sector has not been able to experience the needed growth because the commercial banks that are supposed to be supporting the sector with the necessary funding, shy away from it due to the perceived inherent risks in funding the sector. Export funding can be broadly divided into parts namely; pre and post export financing. The pre-export financing involves the provision of working capital needed for sourcing and processing of goods before export, while the post-export financing involves the provision of funds to cover the funding gap while awaiting payment from buyers abroad after an exporter must have shipped the product. It is interesting to note that while most exporters prefer a pre-export financing facilities, most banks that show a little bit of interest in supporting them prefer to avail them post-export financing facilities. This is mainly due to the fact that the risk involve in pre-export financing is seen to be higher than the post-export financing. The major risk of the pre-export financing include diversion of funds, diversion of goods in transit, purchase of low grade products, theft of goods in the warehouse etc. One major solution to this risk has been the use of a collateral manager. According www.streetdirectory.com, collateral managers basically "look after" collateral on behalf of a lender financing goods. By using a collateral manager, the lender can make sure that goods, such as commodities for example, are being controlled in such a way that if anything goes wrong with the loan, such as the borrower defaulting on payments, then the bank can get its hands on the goods which are the subject of the loan, and sell them to recover monies lent. In Nigeria, collateral managers are being used in export business to control the storage of goods, transit of the goods and eventual shipment to the export destination. In recent times, it is being reported among a number of banks that the use of collateral manager is becoming ineffective in mitigating the credit risk in pre-export financing. This is mainly because some of the exporters have been able to compromise the staff of the collateral management company on ground at the warehouse. This therefore leads to acceptance of low grade goods into the warehouse, while the bank paying for high quality goods, reduction in the quantity of goods in the warehouse despite the presence of a collateral manager, shortage of goods in transit between the warehouse and the port of loading despite the collateral manager escorting the truck. The two major reasons why all these have been made possible is first because the collateral management service is usually outsourced by the bank to a third party hence, the bank is not directly in charge of the goods. Secondly, the staff of this company have poor pay package and this makes it difficult for them to resist the bribe offered by the unscrupulous exporters in order to get them to compromise. In order to permanently solve this problem, the bank will have created a collateral management unit within the financial institution. This should be manned by an experienced person pouched from collateral management company who will setup the unit and also conduct the needed training for his staff. I don't think this should be a challenge for any bank since most of them now own their security unit, loan recovery, fleet management etc. Before I conclude, I will like to say that the Implementation of this recommendations by any bank will put the bank in control of everything happening on the field. It will also give the staff at the warehouse a sense of belonging and thus, leading to them having a sense of ownership over the goods. It will also make the staff to be very careful to ensure that the goods are in order throughout the transaction. All these will definitely lead to a significant reduction in the probability that the staff of the bank will compromise when approached with a bribe from the exporter. Finally, I will like to say that any bank that really wants to support the non-oil export sector have no reason to shy away from the pre-export financing again. This is because, the suggestion offered in this article has showed an effective mitigants that has finally laid to rest the perceived credit risk that had made many financial institutions to stay from this sector. Click Here To Download the App From Google Play Store.....Thinking of Financing or Investing in Export Business? Just like any other nation in the world, Nigeria has a list of prohibited items for exportation. 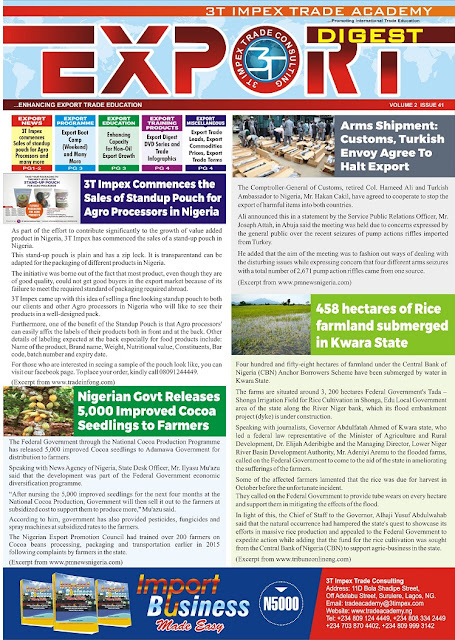 According to the list on website of the Nigeria Custom services, the items prohibited for export include the following: Maize, Timber (rough or sawn), Raw hides and skin (including Wet Blue and all unfinished leather), Scrap Metals, Unprocessed rubber latex and rubber lump, Artefacts and Antiquities, Wildlife animals classified as endangered species and their products e.g. Crocodile; Elephant, Lizard, Eagle, Monkey, Zebra, Lion and All goods imported. The reason for the prohibition of most of the products are very reasonable but for one and that is imported items. I strongly believe that we need to review our trade policies in order to make Nigeria a major trade hub in the sub Sahara African countries. The probation of maize is good because we are not producing enough to meet the local demands. The prohibition of timber export is necessary in order to reduce the impact of climate change on our environment. Raw hides and skin prohibition is also okay in order to first reduce the rate of killing the animals and also create jobs via the value added to them before export. 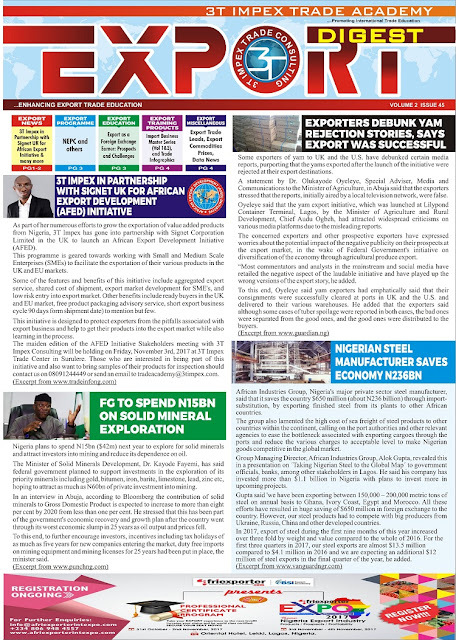 Scrap metals need to be prohibited for export because they are greatly needed by our foundries as raw materials in order to revive the sector (which is going comatose already). Same goes for rubber latex whose processing is not so sophisticated and adding value to it before export leads to the creation of more jobs. The Artefacts and Antiquities are necessary prohibition in order to preserve our heritage while the animals categorised as endangered species need to be prohibited in order to prevent them from going into extinction. The item on that prohibition list that does not have any reason to be there is the prohibition of imported item for exportation. I know that every policy is driven by a philosophy, what I still do not understand is the philosophy behind this policy. Whatever reason that the government might have which is often related to reducing the rate of import into the country and thus reducing the consumption of foreign exchange is no more valid. As a matter of fact, these imported items regularly find their ways out of the countries into the countries West African subregion and beyond via various illegal means and routes. By changing this policy, Nigeria can become a major trading hub for West and Central African countries just like like United Arab Emirates (UAE), United Kingdom (UK) etc who are major trading hubs in their regions. They import a number of items into their countries and these same products are exported out to the countries within their regions. This practice has not collapsed their economy but rather, it has helped them immense economic benefits that I will highlighting in the latter part of this article. The data obtained from globalEDGE™ (is a knowledge web-portal of the Michigan State University) revealed that in 2015, some of the top 10 items imported and exported in the UAE involved the same products. For examples, the UAE imported $45.2B and exported $40.5B of Precious stones and metals, imported $21B and exported $7.9B of industrial machinery, imported $19.1B and exported $8.9B of motor vehicles and parts, imported $3.8B and $3.5B exported plastics, imported $3.5B and exported $2.0B iron and steel, imported $18.3B and exported $8.0B electrical machinery. Most of the top 10 export destinations of this country are within its region in the middle east and these include Iran, Saudi Arabia, Iraq, Oman, Kuwait and Qatar. This same scenario play out also in the case of United Kingdom whose top 10 items of import (like precious stones and metals, electrical machinery, industrial machinery, motor vehicles and parts, plastics, pharmaceuticals, precision instruments and minerals and oil) are also exported to its top 10 export destination in Europe and these include countries like Germany, France, Netherlands, Ireland, Belgium, Italy, Switzerland and Spain. 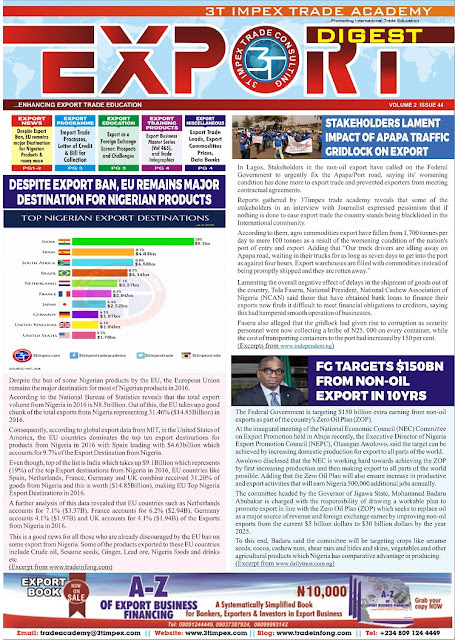 In the same manner and in the interest of sustainable growth in this economy, Nigerians should be allowed to import items, which are neither on the import prohibition list of the Nigeria Customs Service nor in the list of items not valid for foreign exchange as stipulated by the Central Bank of Nigeria, and export the same to our neighbours in the West African subregion and other land locked countries on the continent. This practice, as seen in other countries, has shown the possibility of increasing the revenue of the government via the payment duties and taxes associated with importation. This will also lead to increased employment opportunities that are associated with the increase in trading activities. Legalising the exportation of imported goods will consequently increase the formal trade with West Africa countries and hence the availability of valid data for proper planning. Since the Exporters will now have to open NXP for their export trade, they will also be compelled to repatriate the funds which will in turn increase foreign exchange earnings of the nation. In conclusion, I will like to recommend that the Federal Ministry of Finance do a critical review of the policy prohibiting the exportation of imported goods in Nigeria with a view to changing this policy. The presidency should also setup an inter-ministerial committee that comprises of the Ministry of Finance , Ministry of Trade and Investment, the Central Bank of Nigeria together with other relevant stakeholders to jointly issue a guideline that will make this initiative a sustainable one. This guideline should contain a prohibition list that mainly include items that are currently being produced in Nigeria and exported to various African countries. I am very sure that if the points raised in this article are well noted and the various suggestions acted upon, we will not just begin to see a reasonable increase in the volume and values of non-oil exportation out of Nigeria, but also the humongous economic benefits that comes with such policy as demonstrated in other parts of the world. Despite the prohibition of wood export by the Federal Government, it is sad to note that wood makes the top three export from Nigeria in 2016. 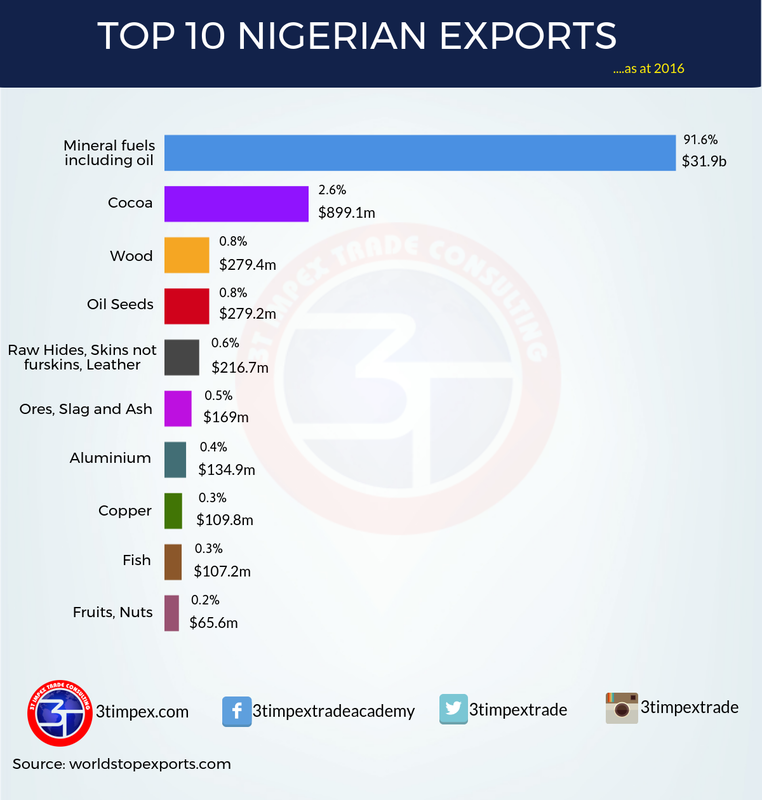 According to data from worldstopexports.com, Wood export from Nigeria account for 0.8% of the total export from Nigeria which represents $279.4M in 2016. The top export products in Nigeria as usual was crude oil and this was $31.9b which represents (91.6%) of the total export from Nigeria in 2016. This is followed by Cocoa which was $899.1m and thus accounts for 2.6% of export from Nigeria. Wood export, though prohibited, is still been exported massively out of Nigeria. This is not a good sign for the current drive in the World towards green energy, climate change and ensuring that the environment is preserve so that we do not leave the earth worse than we met it. 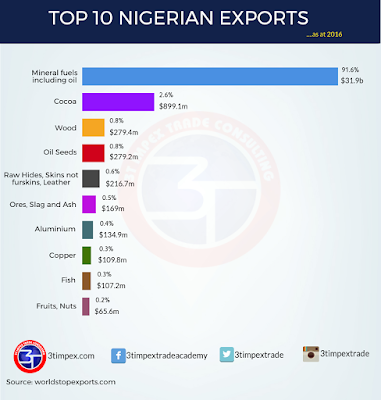 Other top exports from Nigeria include Oil Seeds which is ranked fourth, accounts for 0.8% ($279.2M) of the total export from Nigeria in 2016, Raw Hides and Skins accounts for 0.6% ($216.7m), Ores, Slags and Ash accounts for 0.5% ($169m), Aluminum accounts for 0.4% ($134.9m), Copper accounts for 0.3% ($109.8m), Fish accounts for 0.3% ($107.2m) and lastly, Fruits and Nuts accounts for 0.2% ($65.6m). In light of this, Experts are calling on the Federal Government of Nigeria to put in place stricter regulations that would ensure that wood products especially the unprocessed ones does not escape the shores of the country through any of land, air and sea borders.